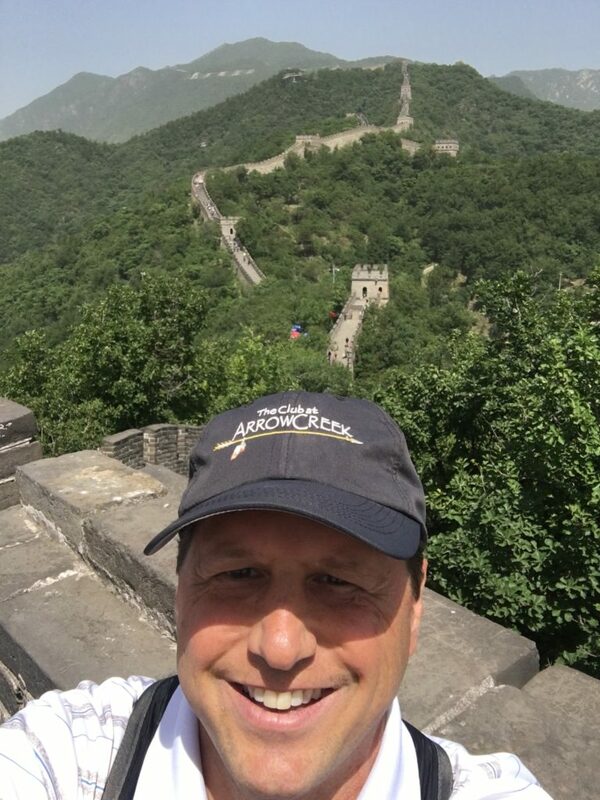 I recently returned from an eight-day trip to China with seven of my “forum” group members, and boy am I still jet-lagged. The other day, I woke up at 1:30 in the afternoon after having gone to bed at 11:00 the night before. But the jet lag has been well worth the experiences I had in Beijing and Shanghai. China knows how to do a Wall! The forum is a group of successful entrepreneurs living here in Reno. We used to be part of the Entrepreneurs’ Organization (EO), but six years ago, we went rogue and now operate independently. Once a month, we meet and share our personal or business experiences. The group listens and offers feedback, functioning as a sort of “board of advisors” to one another. Everything we share is confidential; nothing revealed in the group is ever shared outside of it, not even with our business partners or family. Once a year, we go on a retreat. We’ve spent seven days in the Amazonian jungle, visited Costa Rica and Cuba, and we’ve been fishing in Mexico. 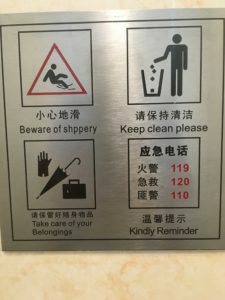 This year, the group picked Shanghai because one of our members has a product manufactured in a Chinese factory, so we had the chance to go on a tour there. We spent the first half of the trip in Beijing and the second half in Shanghai. I had expected China to be like what you see on television: dirty and crowded. For the most part, though, I found it to be the opposite. (Don’t get me wrong, there is a lot of smog in Beijing.) Although China is the most populated country in the world with more than 1.3 billion people, it didn’t feel as packed as it does in the U.S. Beijing and Shanghai are each home to more than 20 million people; compare this to New York City which houses only 8 million people. Even though New York City has a much smaller population, there are way more people on the streets, and it feels much “fuller” than Shanghai, the largest city in the world! The Beijing airport was enormous. There were a lot of people, but somehow, there were no lines or masses. In the city itself, there were lots of newer-looking cars and many scooters that had been switched from gas to electric. It was rare to see “beater” vehicles. The driving took some getting used to. The best way I can describe it is “orchestrated chaos.” Cars would be lined up at a crosswalk, and as soon as each car could squeeze its way through enough pedestrians, on it went! Sometimes scooters zoomed the wrong way in traffic. At one point, we were nearly T-boned in the middle of an intersection — the oncoming car stopped within two feet of us. Looking back, I think the two drivers were just testing to see who could get there first and were in control the whole time. Although the driving seems unpredictable, drivers pay more attention — probably because they have to. In America, we depend on driving laws to keep us safe, but we get lazy and not everyone follows the rules. We took a fun bike tour in Shanghai, and, while it wasn’t a cakewalk, we were never worried for our safety. In fact, I found it to be a thrill! In both the older Beijing and the newer Shanghai, it was easy to see the clash of First and Third Worlds. Imagine old 20- to 40-story buildings with laundry strung from roof-to-roof, almost like a slum – and next to that, a modern, high-tech, architectural-feat-of-a-building. Shanghai was foggy! The fog was so thick that for three whole days we weren’t able to see the looming, 128-story Shanghai Tower from just across the water. (At one point, we did get to go up in the Tower — a very cool experience.) While in the “Bund,” Shanghai’s waterfront district, we enjoyed a drink and a fantastic view of the river downtown. We marveled at all the high-rise buildings with giant, lit-up, full-color billboards, kind of like Times Square. Then, at 11:00 p.m., bam! Everything shut off: the lights, the ads, the fountains. As it turns out, power for all non-essential lights and aesthetic features throughout the city gets turned off at once. I’ve never seen anything like it. For being a communist country, China has a lot of capitalistic aspects. We all know that is the only way you can get anything done and have people prosper. During my visit, I got the impression that it is becoming more common for the Chinese to be running their own capitalistic ventures. Material wealth is widespread and evident everywhere. The factory we visited was owned by a private citizen who also owned the real estate that the factory was on. The factory was clean, modern, and had good working conditions overall, but the workers didn’t wear or probably even have simple eye or ear safety gear. They make $2.50/hour. As Americans, it’s difficult for us to understand what it means to house 1.3 billion people. But, in China, new development is everywhere. 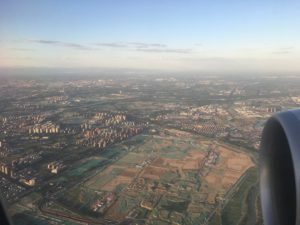 On the drive from Beijing airport to the city, we passed through typical sparse agricultural areas with small houses, immediately followed by a massive development of 10- to 20-story condominiums. It seemed like, everywhere we looked, tall buildings under construction were surrounded by 25 to 40 cranes. We toured many of the notable sites, including the Great Wall, Tiananmen Square, the Forbidden City, and the Summer Palace. Truthfully, after a while, many of the buildings started to look the same; it was the history behind them that made it interesting. The good news? I didn’t gain any weight. I’m not a very adventurous eater, but I did get tricked into eating frog (tastes like chicken, but with more bones). Not a week back home, the forum has already started discussing where we’re going to go next year; we’re leaning toward Japan where my son is currently stationed in the Air Force. Wherever we end up going, I’m sure it will be an adventure. Sometimes things get lost in translation. The view from above. All those tall buildings in the distance are condominiums. 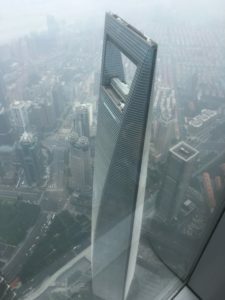 The view from the Shanghai Tower, the second tallest building in the world, looking down on the Shanghai World Financial Center, the ninth tallest building in the world.